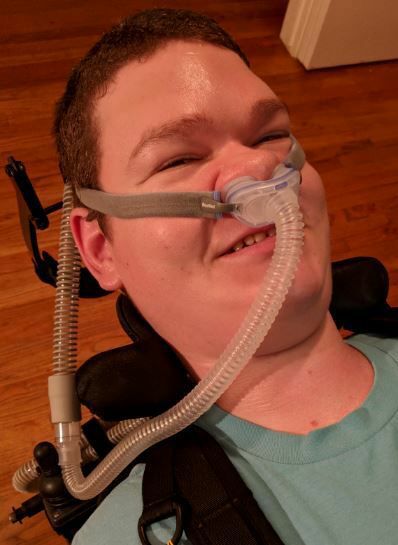 Donovan James Iverson, age 24, born October 3, 1994, passed away peacefully at the home of his older sister in Oroville, California on December 17, 2018 as his mother read verses to him from the Holy Bible, as he had a lot of love for the Lord. Donovan braved Duchenne Muscular Dystrophy since birth. He was our rock star and amazing warrior, never complaining about his illness or the constant pain he suffered. Instead, he was concerned about the health and happiness of his mother, father, and sisters primarily. He considered it his job to take care of them, and he did a fantastic job. Donovan loved Pokémon, especially the Pikachu character from the time he was a little boy. He loved the old Godzilla movies and superhero movies, especially Spiderman and Batman. He was active in Comic-con and went to as many gatherings as his condition would allow, mostly in Batman costume. Donovan loved dinosaurs and was a member of the Feather River Lapidary and Mineral Society in Oroville where he collected many dinosaur fossils and rocks from the Rock and Gem Shows and from the other members. He was also a member of the Chico Lego Users Group (Chico LUG) where he shared his lifetime love of legos with the other members and participated in the Lego shows. He loved to draw and drew many pictures until his condition would no longer allow him to hold pencils and sharpie pens. He lived his life to the fullest possible, it was always about the quality. Donovan lived in Paradise with his mother Tammie and his father Jeff at the time of the Camp Fire that destroyed his home and community he loved so much on November 8, 2018. He lost his beloved pets Ziggy the iguana, Fabio the fat tailed gecko, Jarvis 2.0 the tree frog, Texas Joe and Gunslick the giant Texas millipedes, and two rescue leopard geckos, his entire Lego collection of 200+ builds, his Pokémon plushie collection (he called them all his puppets), his extensive Funko Pops and comic book collection and all of his fossils and rocks among other cherished items. He was devastated and mourned these great losses. Donovan is survived by his mother and caregiver Tammie Strong, father Jeffrey Iverson, siblings Billie Jean (Wenneker) and husband Aaron Archuleta, Jessie Iverson and his niece Thea Iverson-Lix, Kalin Mitchell, Cody Near, Tailer Near, and Dalis Near. Also surviving him are his great grandmother Gertrude Strong, grandparents William Strong ll and Jan (Love) Strong, his great aunt Laurie Jordan, uncle William Strong lll and aunt Amie Strong, uncle David and aunt Karen Strong, aunt Dawn (Strong) and uncle Shannon Starkes, grandparents Danda (Dowling) Winford and James Winford, aunt Jullie (Iverson) and uncle Robert Van Grieken, aunt Julia (Winford) Hart and uncle Quinton, uncle Jason and aunt Mary (Helvie) Winford. Also surviving are many cousins. Donovan was predeceased by his great grandparents, Warren and Erna (Arens) Dowling, William Strong l, and Emil and Hazel (Bullock) Sevanick, and his grandfather Frederick Iverson, grandmother Mary (Sevanick) Lafayette and aunt Virginia (Jeannie) Winford. A Celebration of Donovan’s life will be held on February 16, 2019 at the Paradise Alliance Church located at 6491 Clark Rd. Paradise, California 95969 at two o’clock. A reception will also be held at the Church afterwards. In lieu of flowers, you can give some sort of financial contribution to Donovan’s favorite wildlife sanctuary where he visited frequently and helped in sponsoring his friend, whom he named Boo Boo the bear, at Barry R. Kirshner Wildlife Sanctuary, 4995 Durham-Pentz Rd. Oroville, Ca. 95965. We will also have a jar for Kirshner donations available at Donovan’s celebration.